We’re constantly hearing about the benefits of exercise and the importance of keeping a regular fitness regimen to prevent falls. For seniors, that can mean walking, gardening, strength training, taking Zumba, tai chi line dancing or Pilates classes, or even running marathons. Despite the physical health and fitness challenges that often accompany growing older, the key is staying appropriately active. You may worry about the risk of injury that can accompany some forms of exercise, but the benefits far outweigh the risks. “The goal of most older adults is to remain independent,” says Judy Wright, fitness director at Regents Point, a HumanGood senior living community in Irvine, California. Regular exercise helps maintain strength, improve balance, manage and even prevent diseases like osteoporosis and diabetes, boost cognitive capacity and improve overall mood. 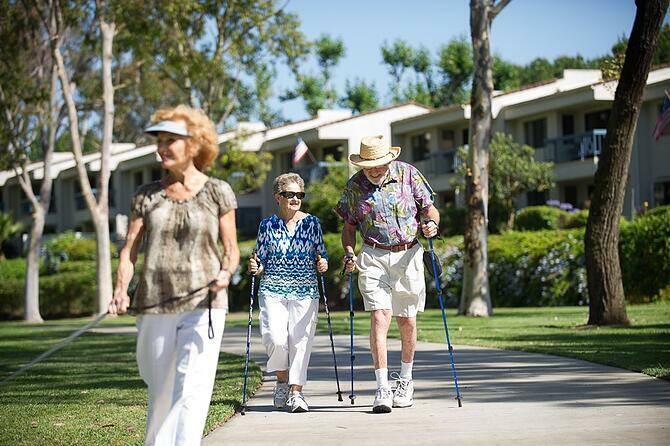 Wright, along with Donna Cazares, fitness director at Royal Oaks, a HumanGood senior living community in Bradbury, California have outlined a practical plan to motivate the most sedentary to get moving and challenge the rest of us to step it up. Here’s their advice on how to get started, set goals and choose the right activities for you. The first step is to establish your starting point. The best way to determine where you are is by tracking how much time you spend moving about—from taking a stroll to gardening—versus the amount of time spent inactive. If you’re not as active as you think you should be, try adding an activity you enjoy to your daily schedule. It’s easy to get started—the Royal Oaks Walking Group meets every Thursday to take a brisk 5-mile walk along the Duarte Bike Trail. They also take walks to Starbucks to grab a coffee or to a neighborhood diner to enjoy a hard-earned meal. “The more you walk, the longer you will be able to do so without the help of a cane to aid mobility,” says Cazares. Setting firm goals helps to motivate you in your fitness journey. Those goals—short and long term—should be realistic and concise. They can range from big to small—from walking a certain distance to beating your high score at bowling on the Nintendo Wii. At Redwood Terrace, a HumanGood senior living community in Escondido, California, residents meet each week to play several rounds of video bowling. The game requires users to stand and swing a handheld controller in the same motion as if they were bowling with a real ball in an alley. Resident Ellen Gifford, a former league bowler, says she feels the burn while playing the game. “I go through the whole action of bowling,” she says. Staying in shape is important to leading a long and healthy life. It doesn’t mean that you can’t have fun while doing it, however. At different HumanGood communities, engaging activities that keep older adults active and mobile are among the most popular. On Monday and Friday mornings at Royal Oaks, residents often get together to play chair volleyball. Within just three months of its introduction, the class became so popular that staff had to expand its availability. Residents enjoy the chance to build upper-arm strength and increase range of motion in their shoulders, says Cazares. At White Sands La Jolla, residents take to the water three days a week for Aquacize, a water aerobics class. The low-impact workout helps residents maintain mobility and build muscle strength. Both Wright and Cazares suggest that you consult your doctor before starting a fitness program. This doesn’t mean exercising is hazardous to your health; it’s just a precaution to take. Your doctor may offer some tips to help you deal with any balance issues or chronic diseases like diabetes.